Sometimes I'll read an article about Sardines being a superfood and I'll get all inspired to eat "healthy fats" and head out to the organic, gluten free section of the gorcery store. I get on this righteous high horse where I'll fill my basket with several cans of wild caught sardines, black bean pasta, Mac & ChResse (note the "R" in cheese.. it's basically a dairy free, gluten free, healthy version of mac & cheese which is made with organic rice pasta and a mustard/nutritional yeast that substitutes as the cheese sauce), soy veggie burgers, and the like. I'll stand in the checkout line feeling "holier than thou", secretly scoffing at the shoppers around me who have Little Debbie snack cakes & Deli meat in their cart. I imagine I'm on some path of edible, organic enlightenment where I'll eat my way to some sort of health food induced nirvana. I'll then schlepp my healthy haul home where I proceed to purge all of the junk food occupying my fridge and cabinets into a hefty bag and toss it into the trash where it belongs. I pause when I get to the Cheese-It's, trying to justify that this yummy cracker snack possesses some sort of nutrional value, then spare them from the purge and hide them behind the organic raw almonds in the snack cabinet (moderation, right?) I then plot out my super healthy lunch which will consist of Sardines, Kale, organic kidney beans and a homemade olive oil & lemon juice dressing. As I prepare this lunch, I envision myself writing a "clean eating" blog, relaying my "journey" into the world of health food. I then sit down to eat, and realize that even the smell of the sardines is nauseating. I hate sardines. No...no...I don't...once I start eating them, my body will realize that I need this miraclous superfood for omega 3's or 6's or whatever and my dewy young complexion will be thanking me once I start eating these babies regularly. I then put a tiny piece of the sardine in my mouth and immediately regret it. NO...I can't. I just CAN'T. What the hell was I thinking? 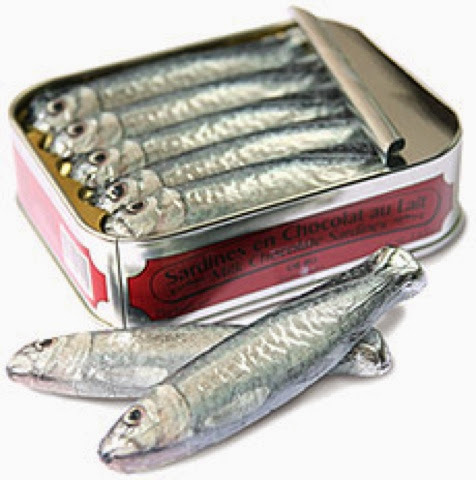 The mere thought of sardines elicits a physical response where my face contorts like I just watched Miley Cirus twerking in a Catholic Church Christmas service. I can't even bring myself to eat a leaf of kale that the sardine touched. Why the hell are sardines a superfood? Why can't Velveeta be a superfood? Damn you, 6 cans of sardines I stil have in the shelf!! I take the remaining sardines on my plate and hustle them down to feed to the cats, then I head to Panera for the U Pick 2 Brocolli Cheddar Soup and Sierra Turkey Sandwich combo. YUM! There's a moderate area between the black and white that is"health fanatic" and "processed food junkie".... and that grey area can be found over at Panera :) On a related side note - if anyone is looking for Sardines (like for fishing bait or something)...give me a call. In other non-sardine related news, my yoga teacher training is just awesome! A few weeks ago our training class held a "Community Teach" where we offered 3 classes to the public at a greatly discounted rate and we got to teach the classes :) We each had a portion of the class we had practiced and taught. The classes were full and there were real live people who looked to us for yoga direction. I was the first to teach, and was pretty darn nervous. I decided if things started to go awry, I'd just embrace it and do something crazy like break into a song & dance routine to the popular 80's song "She's a Maniac". Go down in yoga teacher training history as "the girl who lost her mind at community teach." Luckily it didn't come to that, but it's always nice to have a Plan B. Finally, I hope you're all enjoying your holidays! This was the first year we didn't host anything holiday related at our house. We went to Brian's parents for Christmas Eve and my parents for Christmas Day...no cooking or cleaning or clean-up afterward. I have to admit it was a nice change. The kids have basically been in their PJ's for 3 days playing with all the toys that Santa brought. By far the messiest toy they got was "Crazy Sand"....it's sand that never dries out. It comes in a host of differet colors and there's A LOT of it. A lot. It's pretty much impossible to contain in one room and so it's been tracked from one end of the house to the next....which is all part of the experience. I'm fairly certain this toy will be "misplaced" by the end of the weekend. On the other hand, we're all having a blast with the Frozen karyoke machine Lauren got from Santa. Last night after a few glasses of wine, Brian & I pulled that baby out and belted out tunes to many an 80's classic as the dogs sat on the couch as our "audience" and looked on both puzzled and horrified.